Humourous, Inspirational Music. Created to spread, Joy, Love and Laughter. 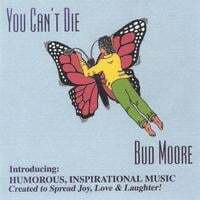 Bud Moore Passed away on May 6 2007 listen to "You Can't Die" Thanks for stopping by. Living testimony of Universal Principle Number Eleven: "Do what you love to do, and the Universe will handle the details of your life,"
For twenty-seven years I was a minister in a mainline Protestant Church, with all the trappings of security: salary, rent-free house, paid health insurance, pension plan, and committees to look after every physical need. Why would a sixty year old man leave all that and plunge headlong into the world of entertainment, writing and singing an unknown style of music? The last ten years of my ministry, 1978-1988, had become especially frustrating, trying to fit into a thought system in which I was no longer at home. The work itself had ceased to be fun for me. Seriousness and struggle seemed to be the watchwords of my denomination, along with duty, sacrifice, and of course, "dignity." I grew more and more discouraged as my Inner Voice continually asked, 'Where is your joy and sense of adventure?" Before entering Seminary in 1958, I had been a full-time entertainer / musician, working in TV, radio, nightclubs and recording. During the years of ministry, I continued to entertain as a sideline, working a lot of banquets, meetings and private parties. As I experienced fun,laughter and applause in those musical settings, I kept wondering why the same ingredients were missing from church life, especially services of worship. Why was religion such a serious business? Didn't God have a sense of humor? In the Fall of 1983, during a time of great discouragement, I came across an article about Arnold Patent, in New Realities Magazine. It described Patent's weekend workshops and how lives were being changed by the Principles he taught. Two phrases particularly grabbed my attention. One was from a woman, who, after taking the workshop, said, 'I leapt off a cliff, and discovered I had wings!" The second was a teaching by Arnold, "Do what you love to do, and the Universe will handle the details of your life." Both phrases burned themselves into my consciousness and gave me great hope. My heart began to sing! I wrote to Arnold, and he told me of an upcoming workshop in Atlanta in the near future. In the spring of 1984, I attended my first of many weekend workshops given by Arnold Patent. By the beginning of 1988, I knew I had to make a decision. I was experiencing a new "calling" to do what I truly loved: to use my music to spread laughter, love and joy. The career struggle had intensified to the point of stark urgency! One night as I retired, I told God that I had to have an answer, and fast...was it going to be music or the church ministry? During that night, I distinctly heard a Voice, so dear that it awakened me from a sound sleep. It said, 'We'll Xerox you an answer!" I wrote down the message and went back to sleep. Although the grammar was incorrect,the phrase was just as powerful the next morning. What could it mean? I phoned the Xerox Company in Atlanta and asked if they had a history of the founding of Xerox or a biography of Chester Carlson, its inventor. In three days I received a booklet, The Story of Xeroqraphy, published by the Xerox Corporation. I was fascinated by the story of Mr. Carlson and his dream of developing a copy machine that was quick and didn't require messy fluids. He actually invented the process and had his first success with it in 1938. However, he spent the next nine years trying to get someone interested in it. He seemed to have an invention that no one wanted. Later, all that changed, and the rest is history. The Xerox machine and its many look alikes are now scattered over the globe, but the original dream belonged to Chester Carlson. He stood by that dream until it became reality. He "went for broke" and staked all he had on a product that many experts said would never work, and even if it did, would never be practical enough to be mass produced.I decided that I, too, had a product the world desperately needed. I had developed a new category of music that I called, "Humorous Inspirational." It was designed specifically to put some of the joy, fun and laughter back into everyday life, especially in the religious world, where seriousness and struggle seemed to be the norm. I saw that fun and joy are not optional; they are actual needs, just as necessary as air and water. Did I have sufficient trust in God and myself to leap off a cliff, to see if I could fly? Could I really "Trust the Universe" for my support, as Arnold's Principle suggested? In June of 1988 I took the "Leap of Faith," and asked for a leave of absence from the pulpit without salary, pension or rent-free house. I have never regretted that decision. Its correctness has been validated in my life over and over again. I had never been outside my home state to give a sermon, but this Humorous Inspirational Music has taken me to fourteen states plus the District of Columbia, to spread joy, love and laughter. In less that two years we were in our own house. The Universe had truly provided. I shall always be grateful to Arnold Patent for the courage and inspiration to follow my dream. I am grateful to Chester Carlson for the example of standing by his dream in the face of overwhelming opposition. Most of all, thanks to my wife and children for their love, encouragement and support. My guitar and I are available for banquets, workshops, retreats, churches, or any gathering where fun and laughter are needed. Some may wonder what dreams, joyfulness, music and laughter have to do with health and health consciousness? The answer is simple - everythinq!